The decent down the south side of Palomares to Niles Canyon was rather annoying. I kept being pelted by these really small, but very cute, 20 mph flying and swarming ladybugs. It was surprisingly painful to be pelted by these cute spotted creatures in the face and I suspect they weren’t that happy about my presence either. I kept closing my eyes. “DON’T DO THAT. You’re wearing sunglasses.” Then I would bow my head down to avoid the flying cuties. “DON’T DO THAT EITHER!” the voice in my head would yell. The cliff on the east side of the road is trying to become one with the creek on the west side of the road and the descent down Palomares is strewn with rocks as erosion takes its course. Closing my eyes and tucking my head were quite stupid moves, so I slowed down to lessen the little critters’ impacts on my face. As a result my descent was quite slow, a fact I would not have ever considered, except for my new life on Strava. I feel like putting in a little notation on that time, “But I was descending through a 5 mile long swarm of ladybugs!” I was covered in ladybugs by the time I got to Niles canyon, a state that was neither as cute nor as creepy as I would have anticipated. Strava has a considerable number of deterrents, especially after the death of a local cyclist who died trying to regain his king of the descent time by going down South Park at freeway speeds. South Park, for those location challenged readers, is a small road through a local parkland. People hike, picnic, let their kids and dogs run free in this rather pretty park. It really isn’t a “freeway speed” type of place. Strava’s allowance of descents in the records is a source of anger for a number of cyclists. I was somewhat appalled to find that someone has set up a Strava segment on the descent down Tresle Glenn from Park to Lakeshore. This section of road goes through a highly populated residential area, has about 4-5 stop signs, and it is quite narrow. Though the road is officially 2 way, it only really has one through lane. You need to pay attention and yield to oncoming traffic as needed. It is a completely lousy section to have recorded as a Strava segment. I felt a bit like complaining, until I actually looked at my speed. I averaged about 21 mph through that section. What on earth was I thinking? I don’t think that you should really go over 20 in that area. How could I AVERAGE over 20? I can see now the problem; it’s smack between my ears. I, not just someone else, need to go slower. Perhaps this Strava descent segment thing is a good idea. I had no idea I had been taking it so fast. Palomares is a 10 mile stretch of road with a peak in the middle, making it a 5 mile climb up and then a 5 mile descent and then, since I usually do this road as an out-and-back, I turn around and do it again. It was way shorter today than the last time I did it. I got to the top and thought, “how did this get here?” I sort of looked around to see if anyone was trying to trick me, but no, I had gotten to the top about 3 miles earlier than usual. The last time I did this climb it had been about 7 miles, 2 miles longer than usual, so I guess it was just trying to even things up a bit. Last time, I had ridden with Richard Mc, a faster rider than me. I took huge pride in having stayed with him, even though I knew he was slowing down to ride with me. Beggars can’t be choosers and feeling happy with your performance always seems like a more pleasant way to go. However, today I clearly wasn’t putting in as much of an effort. My mind wanders. I can’t really push myself when I am on my own. I am at my fastest when riding with my friend MarkN. He is a very supportive cycling buddy. However, he certainly does not need me; he has personal bests all on his own. (We know this fact due to his careful analysis of his ride-with-gps data.) How does he do that? He tells me that mind-wandering is a sign that you are not working hard enough. I certainly believe that, but my mind ALWAYS wanders. What else is it going to do? That is what minds do best. It is like they were put on this earth to go places without you. I was going up Palomares and my mind was constructing emails I have yet to write. Having been inspired by both Jason and Mark, I bought my own little Garmin device and am now connecting to both ride-with-gps and Strava. (I am letting the two systems battle it out by seeing which one likes wasting my time more.) I thought I could channel Mark and become a more focused rider by being able to look at my data, but this doesn’t seem to be panning out. I get notices like “my current place on this climb is 721st out of 904.” I am not inspired. However, I had a good day. Leimert was super easy, Redwood was easy in both directions, and by the time I had finished with Palomares it had shrunk by another 3 miles. I love Willow Creek Golf course. I just love it. The guy who runs the little “cafe” there now recognizes me or perhaps the fact that I am now in love with him has allowed me to fall into this delusion. I go there in the winter and he cooks me eggs. I go in the summer and he gives me cups of ice to fill my camel back. I buy a candy bar and a glass of coke with ice and think how great my day is going. The return up Redwood was uneventful, save for a second Ladybug swarm as I climbed to Joaquin. 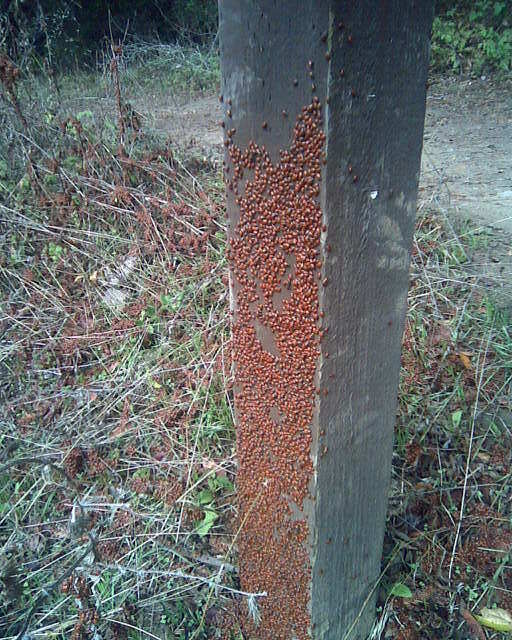 Ladybugs swarming in Redwood park. This picture wasn’t taken on this ride. It was taken on a hike a few years ago. Totally agree about Trestle Glen. That’s a really dangerous road to try to descend quickly. I always feel like “game over” as soon as I turn on trestle glenn. I can’t imagine trying for time.